Let’s be further clear that there is a movement to kill union and it is in no way supported by Beth Dimino. It is enabled, however, by our history of concession to reforminess. Look at the UFT 2005 Contract. Look at Michael Mulgrew helping to craft the APPR law. Look at him praising the Heavy Hearts legislature for making it worse. Look at Bill Gates addressing the AFT Convention. And those are just a few of the low lights. When you cannot muster a proactive argument, logical fallacy is one way to go. What’s truly pathetic is that this is what our leadership chooses to put forth as their voice. Among teachers, there are quite a few thinkers, quite a few creative and passionate souls. Judging from what passes for argument among leadership, and how they choose to treat people who speak their minds, they haven’t got the remotest notion what a creative and passionate thinker even is. She has a vision for what the public schools and a powerful teachers’ union should be like and she goes about achieving her aims in a way that gets you on board even when she doesn’t have a patronage mill of jobs at her disposal. Beth is the union leader that Unity fears because she is that good at what she does. Chatter has been coming in to Ed Notes about just how much of a threat Stronger Together, the statewide opposition caucus to Unity in NYSUT is viewed by Randi Weingarten and her liege Michael Mulgrew. Harris L. from the ICEUFT Blog- I’m proud to be a member of Stronger Together and proud to be a friend of Beth Dimino. Sean Crowley from the Ed Notes Online blog- Couldn’t be any happier. Unity and Co. and their fake union stooge movement lashing out with this errant punch at a real unionist like Beth and a real Caucus like ST can only boomerang on them. And from what I’m reading the Unity slugs are catching it square in the teeth. Roseanne McCosh from the Ed Notes Online blog- Thanks, Unity. You saved me from myself. I will no longer fact check and I will believe every word you speak or write is the truth. I will now withdraw my support of ST and donate 100% of my pay to UFT COPE. Beth in bed with the Koch brothers, you say. How scandalous! And I will start a petition to have Beth tarred and feathered for her treacherous ways. Seriously…. who do these jackasses think they’re convincing? I never bothered to cancel my COPE contribution of a lousy $5 per month but I sure will now. Not many members in my school belong to COPE but I will actively seek them out and explain why they too should cancel. Is this the result you were looking for Unity? Unity gives money to politicians who screw us with their votes and Beth called them out on it. Unity uses that money to weild power but never uses that power to do right by the rank and file and Beth calls them out on that too. They act as if they’ve taken the high road. PULEEZE! What balls! If only they showed those big balls when it comes to fighting the real enemies—-like Randi Weingarten and her buddy Bill Gates or Hilary Clinton and her buddy Eli Broad. So Unity Caucus seemed to think that this would help them with the ir VOTE-COPE drive. I wonder how that’s going? 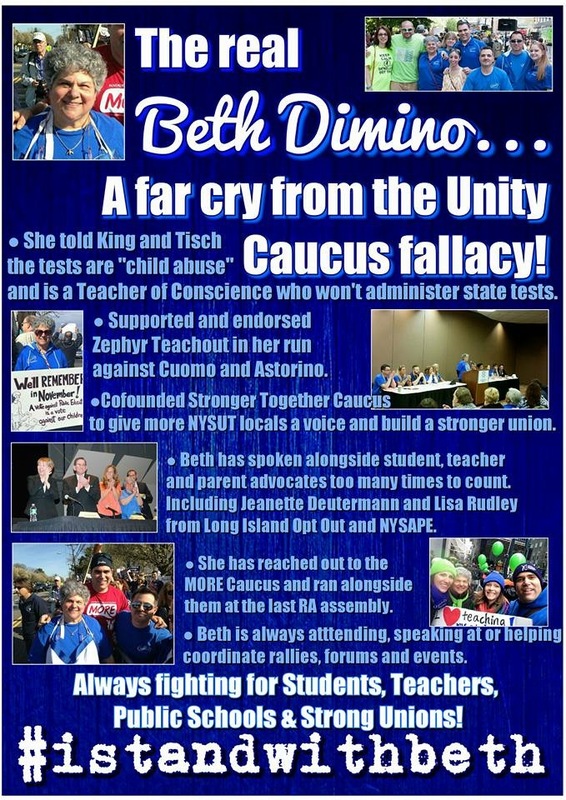 This entry was posted in General and tagged Dimino, nysut, STCaucus, Unity Caucus, VOTE-COPE. Bookmark the permalink.